Paul Manafort reportedly under FBI surveillance from 2014 until this year. Paul Manafort at the Mayflower Hotel April 27, 2016 in Washington, DC. There are many potential vulnerabilities in President Trump’s legal defense in the multipronged investigation into his Russian ties—Jared Kushner, Donald Trump Jr., Mike Flynn, Trump lawyer Michael Cohen, advisers Roger Stone and Carter Page, to name a few in Trump’s orbit—but former campaign chief Paul Manafort, so far, appears to be the biggest liability. On top of all we know already about Manafort’s shadowy overseas political consulting operation, CNN reported Monday that Manafort was under FBI surveillance dating back to 2014, well before he joined the Trump campaign. The FBI eavesdropping continued, although apparently not continuously, until earlier this year, after Trump had taken office. Manafort was fired from the campaign months before Election Day, but continued to communicate with Trump into his presidency. 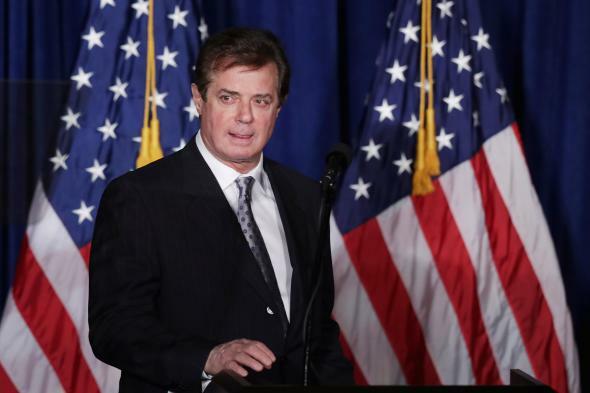 Manafort caught the attention of the FBI, unrelated to Trump, for his work in Ukraine with the party of Kremlin-backed former President Viktor Yanukovych, who came to power in 2010, but was ousted by nationwide demonstrations in 2014. The FBI surveillance was authorized by a Foreign Intelligence Surveillance Act (FISA) warrant, a top-secret process that oversees national security cases. For a judge to grant the warrant, the FBI doesn’t need to show evidence of a crime, but it must show that the individual may be working as a foreign agent. It’s unclear when exactly surveillance of Manafort restarted, but in August, CNN reported that U.S. intelligence intercepted suspected Russian intelligence officers discussing Manafort in the summer of 2016, months before the election. “The suspected operatives relayed what they claimed were conversations with Manafort, encouraging help from the Russians,” CNN reported at the time. Manafort’s work abroad, particularly in Ukraine, weaved together dodgy political affiliations and murky financial dealings. Manafort’s jazz-like interpretation of American laws, despite the attention of American investigators, may not have been enough to do him in, but then in June 2016 Manafort popped up much closer to home—as the campaign manager of the presumptive Republican nominee for president, Donald Trump. By late August, Manafort was out at Trump headquarters, replaced by Steve Bannon, but Manafort remained a person of interest and when Robert Mueller was designated Special Counsel in June 2017, the former FBI chief picked up the pace and intensity of the probe, particularly of Manafort. “Dispensing with the plodding pace typical of many white-collar investigations, Mr. Mueller’s team has used what some describe as shock-and-awe tactics to intimidate witnesses and potential targets of the inquiry,” the New York Times reports. “Mr. Mueller has obtained a flurry of subpoenas to compel witnesses to testify before a grand jury, lawyers and witnesses say, sometimes before his prosecutors have taken the customary first step of interviewing them.” In July, federal agents conducted a predawn knockless search of Manafort’s Virginia home, commandeering files that may provide evidence of offshore financial dealings. To obtain the warrant, Mueller would have needed to convince a judge that inside Manafort’s house was evidence of a crime. Instead of invitations to the prosecutor’s office, [Manafort and Flynn associates] have been presented with grand jury subpoenas, forcing them to either testify or take the Fifth Amendment and raise suspicions that they had something to hide. At least three witnesses have recently been subpoenaed to testify about Mr. Manafort: Jason Maloni, a spokesman who appeared before the grand jury for more than two hours on Friday, and the heads of two consulting firms — Mercury Public Affairs and the Podesta Group — who worked with Mr. Manafort on behalf of Viktor F. Yanukovych, the pro-Russia former president of Ukraine. Mueller’s tactics and pace appear to be born out of a sense of urgency to make significant progress in the investigation before it can be accused of being a fishing expedition and the general sense of impunity of Trump associates, even those under investigation, that might require tougher treatment to ensure compliance.